February 20, 2013. 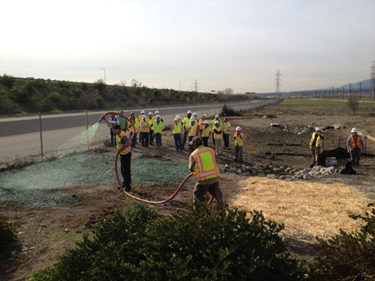 TME is partnering with URS Corp to conduct a series of statewide training courses for Caltrans. Each two-day course begins with an overview of water pollution control requirements and responsibilities, and ends with a hands-on field demonstration. The field demo allows Resident Engineers and other Caltrans staff to see first-hand how BMPs such as hydro-mulch, DI protection, fiber rolls, silt fence, and check dams are properly implemented. Participants get to try their hand at straw mulching and hydro-seeding, among other activities. TME’s reputation as California’s foremost Storm Water authority was key in its selection for the job. The courses, which are part of Caltrans’ Resident Engineer Certificate Program, will be taking place throughout the months of January, February, and March 2013.